I don't wear a lot of accessories. Usually, it's just my wristwatch and perhaps a necklace if I'm feeling fancy. As the year goes on, I found myself looking into more accessories to pair with my clothes. The curse of becoming a fashion victim. Finding excuses to buy pretty products. Though, I wanted classic and elegant designs. Nothing bold or extravagant, but timeless pieces were hard to find. That's where Eve and Rosie* comes in. From rings to bracelets to necklaces, they have such a great selection for girls like me. Broke but still finding ways to look cute. Based in Brunei, they were so kind to send some gorgeous pieces to review. I alternate between two necklaces most days. Both with an owl design, and both I wear too often. After much contemplation, I decided to get a new everyday necklace. I looked around Eve and Rosie and found ‘Victoria’. The design is delicate and simple, which is why I love it so much. Victoria is versatile, pairing it with anything is a breeze. It's versatile pieces like these I treasure. This little pearl, I can only describe as eau-de-nil, a pale white-green. Transparent beads beside it, hanging by a gold plated chain. I stared in awe. Is this what love at first sight feels like? I felt compelled to get this bracelet from their September Bracelet Collection. It’s called ‘Bellatrix’ for Snape’s sake! If I didn’t get it then that would be Lestrange of me. Someone better give me a high five for that pun. All the bracelets from the collection are lovely in their own right. 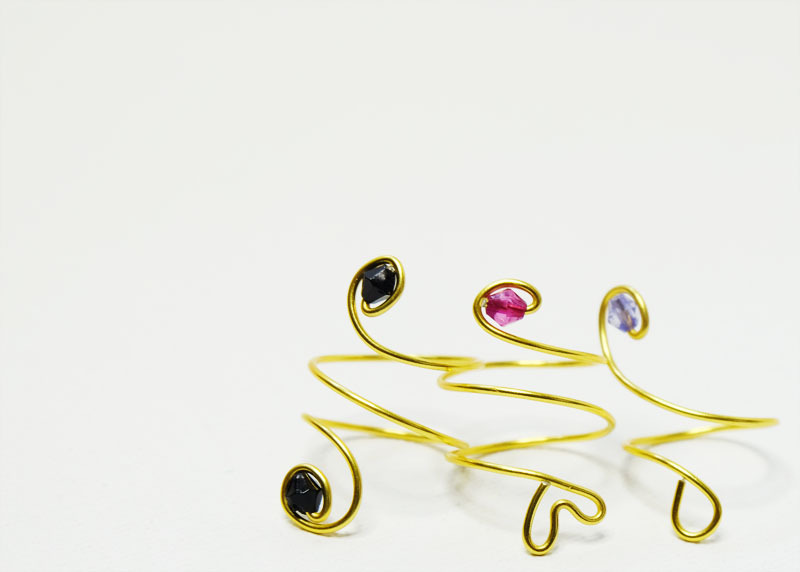 This bracelet, like the namesake, had a certain intriguing beauty to the design. Maybe it’s the monochromatic palette, a touch of white against black. A perfect combination. This gem is my personal favourite among Eve & Rosie's rings. The photos don’t do justice to the Lapis Lazuli ring. The stacked cold stone ring is gorgeous, blue with touches of marble grey. Though it is one of the more expensive rings at $10, I wear it the most often with basic pieces. Eve and Rosie also provide button rings, cheaper alternatives to Swarovski crystals. ‘Panther’ rings come in Thunder, Storm, Passion and Raven for $6 each. These handmade rings are modest and easy to style. My personal way is to stack two or three of them together. It’s a low-key technique but always so fun. Pythons may be my favourite collection from Eve and Rosie. The coiled swirls remind of actual reptiles wrapped around my fingers. They are beautiful, such a simple statement piece to own that I adore. With that said, Pythons are incredibly malleable. There are advantages to this. Transforming them from rings to knuckle rings with just a few squeezes. I like using them as knuckle rings, especially since I can shape it to my fingers. However, I found myself idling and adjusting the pieces as the day went by. That could just be my compulsion to touch rings. They bend easily but for $6.00 for a stack, I say it’s worth the price. If you're looking for classic and affordable pieces, then I highly recommend Eve and Rosie. It's hard to find local sellers that have pieces that won't break bank. The designs are all handmade by the amazing Zahra Zamari. I had the pleasure of sitting down and having coffee with her. It's clear how much time and effort she puts into her business. She adorns all these wires into beautiful accessories. I say this from the heart; I think she's super cool. So cool that she also accepts requests for custom made items! You can check out Eve and Rosie's shop here that also doubles as their Instagram. If you're in Brunei, you can contact them at +673 8645988. If not, send an email over to eveandrosieonline@gmail.com! They reply fast-well, faster than me. So what do you think of Eve & Rosie? What pieces would you get? And I love the first lot of rings! Stunning. 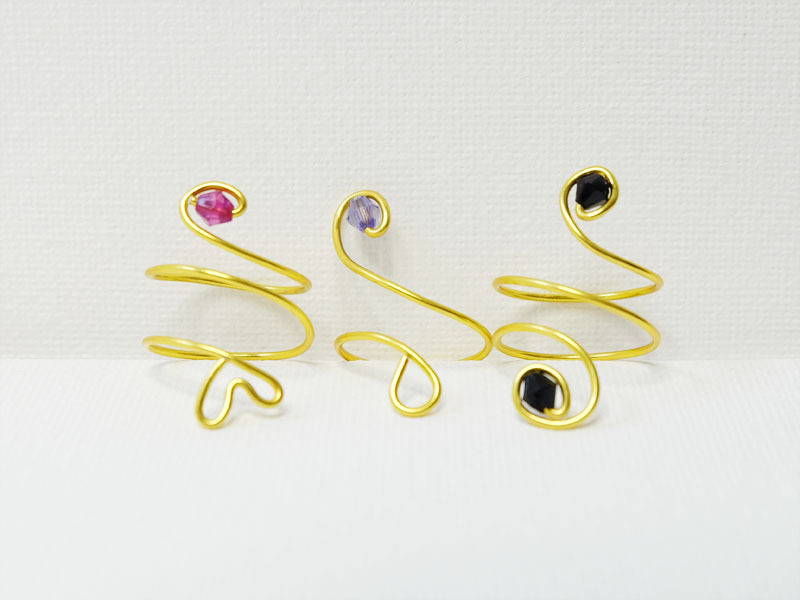 Handmade jewellery feels so much nicer and I love the look of the swirly rings. They are so pretty and trendy! What pretty jewelry! I also struggle with accessories and am trying to wear more now. They really do add to an outfit. The pieces look so beautiful and elegant! I love the python rings as I have never seen any like them! I love the dainty rings- really pretty! Everything is so gorgeous! I love those stacking rings - the gems are such gorgeous colours! Beautiful rings :) Wonderful post..Keep In touch dear..
Amazing collection! I love every piece haha, your blog is lovely! These are lovely,especially the necklace! Nice necklace, so cute! Bonjour from France, Sand. This jewelry is beautiful. Thanks for sharing this designer with us. Those accessories are purely amazing! I love it! I want all! Wow! I love those python rings. They are stunning. Wow! These pieces are absolutely stunning! Gorgeous! Your Harry Potter pun made me laugh out loud. All of these pieces are gorgeous too. Haha I love your Bellatrix puns! And that lapis lazuli ring is so pretty. Lovely pieces! Such cute pieces of jewlery! Love them! Classic pieces indeed! I'm so in love with these kinds of accessories. Others may find a bright accessory to be the perfect fit for their outfits, but nothing really beats a gold, timeless necklace or bracelet! My favourites have to be both set of rings, I don't wear necklace much but I do like the one you received. Very simple and perfect for lots of outfit. The photography in this post is flawless! These pieces are so pretty & unique, I tend to find you only get nice jewellery like this when it's handmade! I really love the Lapis Lazuli ring, so dainty :-) I'm sure all the pieces look lovely on you too, great post! The color of gold isn't my style, but I love the diversity of pieces you could get. Beautiful jewels! Each piece has its own unique beauty. Have a fun week! really gorgeous colors! the ring with the natural stone is probably my favorite one you showed! Wow! Gorgeous pieces. I'm now on instagram. Following you there. Pretty accessories! I hope you can always keep in touch. Love every single pieces. The blue pearl has to be my favorite. I looove the blue lapiz one! Your jewelry is so pretty! I love gold and color. Love the blue ring but loved the Harry Potter pun more, high five!! The bracelet and ring are beautiful! Especially the ring, I'm so into dainty delicate rings lately and this is the perfect mix of delicate with gem stones. LOVE! Awesome pieces. I especially love the lace bracelet! That black panther ring is amazing, Bash! So nice of you to feature your hometown brand. Thumbs up! These pieces are so lovely! It's always so hard to see details in photographs, but I can totally imagine how gorgeous these pieces are in person!